Installing a pergola this year is one of the best ways to beat the heat that comes with the season! In fact, building a pergola is one of the most rewarding decisions you can make for you backyard sanctuary. Pergola installation on your property can create shade, increase the quality of time you spend relaxing and entertaining outdoors, as well as add value to your property. Here are the top five benefits to adding a pergola to your backyard. Building a pergola on your property produces one of the most exciting options to enjoy outdoor living, creating a nice elevation that matches your property architecture. Pergolas provide a shaded area where you can enjoy a warm day without having to worry about becoming overexposed to damaging UV rays. You can add a natural roof made of climbing flowers, instantly creating a natural space where you can relax. A professional designer can even create a pergola with an optional canopy that you can open and close as needed based on the weather conditions. When it comes to the design, the options are limitless! If you want a definite purpose in your outdoor area, a pergola is the perfect solution! A pergola adds definition to your backyard, creating a space within your backyard with a distinct purpose. With comfortable seating, tables, and a fireplace, your pergola can be used as an outdoor entertainment area. You can also add a dining room table to create the perfect place to dine under the stars. A properly planned pergola will help create space where you can gather with loved ones to wine and dine in the great outdoors. A pergola adds beauty to your property taking your backyard to the next level! Apart from providing shade, a pergola can be formed in a way that it provides esthetic value to the entire property. One of the best aspects about a pergola lies in it’s versatility. It can be applied as a lead into other structures, such as a verandah or gazebo, you could use your pergola to lead to a solitary gazebo from your back door, creating an inspiring outdoor living area, or they work on their own. No matter how you decide to incorporate your pergola into your backyard, remember that this versatile structure does not have to be on its own. 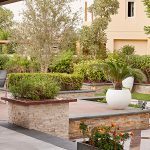 In fact, it often works best when combined with other backyard designs! If you are looking to add an element of privacy to your backyard, a pergola provides the perfect opportunity. A pergola allows for privacy. 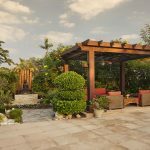 Although it may be an open space, you can create privacy by adding drapes, latticework, screens, or even climbing plants to any side of the pergola. Pergolas provide the perfect place for a quick meeting or an urgent discussion with clients and friends. Pergola’s add an attractive addition to any backyard. You can make them even more appealing by adding decorative accessories like hanging pots, lights, curtains, accent pillow and much more. Pergolas allow you to create an outdoor living space that you love by adding elements that suit your personal tastes and style. 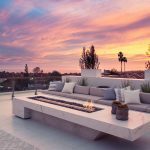 This gorgeous outdoor structure will transform your outdoor area and create a living space where you can entertain friends and family for years to come. No matter what you use it for, you can be sure that you will love owning a pergola! Aside from looking fantastic, providing shade, and creating a distinct space pergolas add value to your home. Adding a pergola to your villa can increase its value by up to 20%! As an affordable design option, the benefits are enormous. Pergolas add beauty and intrigue to your outdoor area, which improves the value of your home. At Milestone, we design and build stunning pergolas that are guaranteed to transform your backyards and we’d love to do the same for you! Take a look at some of our recent pergola designs.